There are two basic types of knife - essentially called Eastern and Western. This type of knife is made from harder steel. The knifes blades are thinner and the knife is therefore lighter. The bevel edge is more acute. This means the blade will become very sharp, but need lots of maintenance to keep it sharp. The knife will be excellent for decorative cuts, sushi and so on. It is harder still, so will take longer to sharpen. This type if knife is made from softer steel, and the blades are thicker and heavier. They need less sharpening the the knives above, but don't get quite a sharp. The edges will need less maintainance and are excellent for chopping and other heavy knife work tasks. Granton Edge: The blades of these knives have hollow oval areas formed into each side of the blade. The food does not stick the blades quite as much. Excellent for slicing meat and fish. 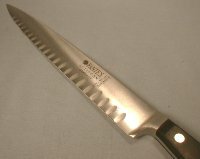 Serrated Knife: A typical example is a bread knife where the serrations are what allows the knife to cut through bread. Serrated edges cannot really be sharpened. A properlyh sharpened plain flat edged knife will cut most food alot easier than a serated knife. If your knife fails to cut a tomato cleaning - sharpen it! The serrated knived are low end as the steel is not so important as it is not as serious to sharen it to fine razor sharpness as the sawing action is more important.